Sales in Europe of diesel-fueled vehicles have taken quite a hit in recent years in the aftermath of the Volkswagen Group’s costly emissions scandals, but there’s still a significant segment of the market with an appetite for the TDI. VAG’s premium brand Audi is confident even a high-performance diesel still makes sense in today’s automotive scene, prompting the Four Rings to give the SQ7 a kid brother. Say hello to the new SQ5 TDI and its ample amount of torque: 516 pound-feet (700 Newton-meters). At the heart of the latest Audi SUV is a 3.0-liter, 342-horsepower V6 with a mild hybrid twist in the same vein as the mighty SQ7. It boasts a 48-volt main electrical system and is fitted as standard with an electric powered compressor (EPC), with the energy coming from a lithium-ion battery pack installed underneath the cargo floor. While this may sound a bit boring, the electrified component is there for a very good reason – to eliminate turbo lag, with Audi describing the EPC as being the turbocharger’s ideal assistance. The EPC kicks in right away and helps the SQ5 TDI in the low-rev range up to 1,650 rpm whenever the exhaust gas flow sends too little energy to the turbocharger. The amped-up Q5 needs 5.1 seconds to reach a “highway speed,” which is probably Audi’s way of saying 62 mph (100 kph). Flat out, it will do an electronically governed 155 mph (250 kph). Not only does the electrified powertrain provide more performance than a conventional setup, but it also saves fuel. Audi promises fuel savings of up to 0.7 liters / 100 km in the real world, so you get the best of both worlds. 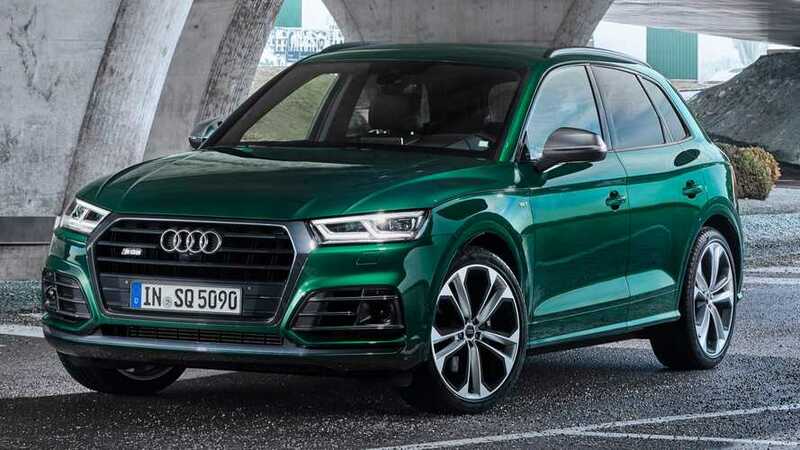 It goes without saying the SQ5 TDI has Quattro all-wheel drive as standard, which receives the engine’s power from an eight-speed tiptronic transmission. The automatically adaptable AWD can send as much as 70 percent of the muscle to the front wheels or 85 percent to the rear axle. As with just about every other model from Audi Sport, the styling upgrades over the regular Q5 are subtle. The premium SUV looks a bit more aggressive than the lesser variants, but it’s not immediately noticeable. As standard, it rides on 20-inch alloy wheels or you can opt for a larger 21-inch set at an additional cost. At home in Germany, the new Audi SQ5 TDI will go on sale this summer with a starting price of €67,750. As a final note, there will likely be another SQ-badged diesel SUV from Audi taking into account the SQ8 was spotted at the end of November 2018 carrying the TDI badge. 700 Nm (516.3 lb-ft) of torque, output 255 kW (347 hp): The new Audi SQ5 TDI* once again has a powerful V6 engine under the hood, just like its successful predecessor of the first generation. An electric powered compressor ensures that maximum torque is available to the sporty SUV at just above idle; a mild hybrid system further enhances efficiency. The 3.0 V6 TDI engine in the new Audi SQ5 TDI combines instant and supreme power with high efficiency. 255 kW (347 hp) and 700 Nm (516.3 lb-ft) – this massive torque is available continuously across a broad range from 2,500 to 3,100 rpm. The V6 diesel accelerates the sports SUV to highway speed in 5.1 seconds on its way to an electrically limited top speed of 250 km/h (155.3 mph). In the NEDC it consumes between 6.6 – 6.8 liters of diesel per 100 kilometers (35.6 – 34.6 US mpg), corresponding to 172 – 177 grams of CO2 per kilometer (276.8 – 284.9 g/mi). The SQ5 TDI is certified according to the Euro 6d-temp emission standard. Audi has systematically refined the drive concept from the full-size SQ7 TDI* for the new SQ5 TDI. The 48-volt main electrical system includes an electric powered compressor (EPC) and a mild hybrid system. Energy is stored in a compact lithium-ion battery with an electrical capacity of 10 Ah located beneath the luggage compartment floor. An AC/DC converter connects the conventional 12-volt electrical system. The electric powered compressor is the ideal assistant for the turbocharger. It helps out whenever the exhaust gas flow provides too little energy to drive the turbocharger, i.e. when starting off and accelerating in the low-rev range up to 1,650 rpm. High torque is available immediately with no turbo lag whenever the driver needs it, whether starting off, passing or exiting a curve. In everyday driving situations, the early and rapid torque development made possible by the technology keeps revs and fuel consumption low. The electric powered compressor is located in the intake air path downstream of the intercooler and close to the engine. If the load demand from the accelerator is high but there is still too little boost from the turbocharger, the EPC comes into play. A compact electric motor with an output of 7 kW accelerates the compressor wheel to 65,000 rpm in roughly 300 milliseconds, producing a relative boost pressure of 1.4 bar. The MHEV system (mild hybrid electric vehicle) in the new Audi SQ5 TDI can reduce real-world fuel consumption by as much as 0.7 liters per 100 kilometers. At its core is a belt alternator-starter (BAS) connected to the crankshaft. During deceleration, it can recuperate up to 12 kW of energy. This electrical energy is stored in the lithium-ion battery, from where it is dynamically distributed to the consumers in the electrical system. If the driver lifts off the accelerator at a speed between 55 and 160 km/h (34.2 and 99.4 mph), the new Audi SQ5 TDI can, depending on Audi drive select setting and driving situation, either recuperate, roll at idle with the clutch disengaged or coast with the engine off for up to 40 seconds. The BAS restarts the engine the next time the accelerator is depressed, and that noticeably faster and more smoothly than a conventional starter. MHEV technology allows for start/stop operation at a speed of up to 22 km/h (13.7 mph). If the vehicle is equipped with the adaptive cruise control (ACC), the engine restarts while the brake pedal is still depressed as soon as the vehicle in front of the SQ5 TDI begins to move. This top output version of the 3.0 V6 TDI engine has been further developed and modified in numerous areas. Crankshaft, pistons, connecting rods and oil management have all been specially configured for the more stringent demands. The thermal management system is highly versatile. The crankcase and the cylinder heads have their own cooling circuits, allowing the engine oil to warm up quickly after a cold start. The coolant flow is directed to the oil cooler, the EPC, the BAS and the turbocharger as needed. The large exhaust gas turbocharger with variable turbine geometry (VTG) produces a relative boost pressure of up to 2.4 bar. A sound actuator in the exhaust system gives the TDI a sonorous sound. A fast and smooth-shifting eight-speed tiptronic handles the power transmission. Its lower gears feature short, sporty ratios, while the upper gears are long to reduce revs and fuel consumption. New detailed solutions enable the tiptronic to work effectively with MHEV technology. If the sport SUV is rolling and the engine is idling or shut off entirely, a clutch in the central transmission opens and interrupts the power connection. An electric oil pump enables the tiptronic to engage the gear while coasting that will be needed at restart. Like every S model from Audi, the new SQ5 TDI comes standard with quattro permanent all-wheel drive. In normal driving conditions, its self-locking center differential distributes torque between the front and rear axle in a 40:60 ratio. When slip is detected, the majority of the power is directed to the axle with the better traction. Depending on the driving situation, a maximum of 70 percent can flow to the front or 85 percent to the rear. Wheel-selective torque control, an intelligent software function complementing the quattro drive, is active on all kinds of surface. During dynamic cornering, it brakes the wheels on the inside of the curve minimally before they begin to slip. The power is thus directed via the differential to the wheel with the better traction. The sports SUV turns into the curve ever so slightly. Its self-steering behavior remains neutral for a long time, and handling remains stable, precise and agile. Customers can also order the SQ5 TDI with a sport differential on the rear axle. It actively distributes the power between the rear wheels during dynamic cornering. The sport differential literally pushes the car into the curve, nipping understeer in the bud. It sends more torque to the outside rear wheel when accelerating out of tight radii to further improve agility. Sophisticated five-link suspension at the front and rear lays the foundation for the sporty driving characteristics of the new Audi SQ5 TDI. Audi also offers optional dynamic steering, which uses strain wave gearing to vary the steering ratio over a very wide range as a function of speed and steering angle. The suspension with damper control comes standard in the new SQ5 TDI. It lowers the body by 30 millimeters (1.2 in) compared with the Q5 with standard suspension. It offers a particularly wide spread between comfort and dynamics. Along with the sport differential, engine, steering and tiptronic, the dampers are integrated into the Audi drive select dynamic handling system. With Audi drive select, the driver can vary the function of these systems via multiple profiles. Audi also offers the S-specific adaptive air suspension as another option. It adapts not just the damping but also the body’s trim to the respective driving situation. The new Audi SQ5 TDI comes standard with 20-inch cast aluminum wheels and 255/45-series tires. 21-inch wheels are available as an option. There is also a choice of three different 21-inch wheel designs from Audi Sport GmbH. Aluminum six-piston calipers on the front axle grip steel discs with a diameter of 375 millimeters (14.8 in). The black calipers (red optional) sport S logos. The new Audi SQ5 TDI offers a broad portfolio of driver assistance systems. The predictive efficiency assistant provides specific tips to help the driver save fuel. Audi active lane assist makes it easier to stay in your lane and can handle some of the steering task in slow-moving traffic. The distance warning display alerts the driver when the distance to the vehicle ahead drops below a safe distance. These and other functions are brought together in the optional Tour assist package. The optional functions rear cross traffic assist, exit warning, collision avoidance assist and turn assist also enhance safety in everyday driving. The same applies to the pre sense systems; Audi pre sense city comes as standard. It warns the driver about pedestrians and vehicles, and if necessary initiates automatic emergency braking within system limits. Park assist, camera-based traffic sign recognition and hill descent control round out the optional features. The MMI control concept in the Audi SQ5 TDI is easy to understand and features an intelligent free text search function. The natural-language voice control function also recognizes inputs from everyday speech. The third control level is the leather multifunction steering wheel, which is used to operate the driver information system or the optional Audi virtual cockpit. Depending on the setting, its 12.3-inch display shows an S-specific mode centered around the rev counter. Audi supplements this with a head-up display. The infotainment lineup in the Audi SQ5 TDI follows a modular concept. At the top is MMI navigation plus with MMI all-in-touch and an 8.3-inch display. A standard component of the top system is Audi connect, which connects the SQ5 TDI to the internet via LTE and provides a WiFi hotspot for the passengers’ mobile devices. The Audi phone box connects smartphones to the on-board antenna by near-field coupling and simultaneously charges them inductively using the Qi standard. The Audi smartphone interface brings Apple CarPlay and Android Auto into the car. For particularly discerning hi-fi fans, the Bang & Olufsen Sound System with 3D sound is available. Numerous exterior design details hint at the sporty character of the Audi SQ5 TDI. The bold bumpers feature strongly contoured air inlets up front and a diffuser insert with a honeycomb grille at the rear. The Singleframe grille features double aluminum slats and contrasting trim elements in twilight gray matt. The S logo with red rhombus is used in numerous locations to set additional accents. The headlights and rear lights of the Audi SQ5 TDI come standard in LED technology; the dynamic turn signals at the front and rear send unmistakable signals. The exterior mirror housings and the clasp on the diffuser sport a shining, aluminum-look finish. Door trim strips in the body color underscore the sportiness. The exterior color panther black is reserved exclusively for the Audi SQ5 TDI. The dark-toned interior welcomes the driver and passengers with illuminated door sills bearing exclusive S logos. Contrasting stitching on the leather steering wheel and sport seats conveys a dynamic and elegant ambiance. The S sport seats in leather and Alcantara can be upgraded to fine Nappa leather with rhombus pattern and a pneumatic massage function. Brushed aluminum inlays are standard, with elegant wood applications or an exclusive carbon inlay available as options. The shift paddles on the steering wheel sport an aluminum-look finish; there are stainless steel applications on the pedals and footrest. The optional rear seat bench plus in the new Audi SQ5 TDI is split into three segments. Longitudinal and seat back angle adjustment are optional. The luggage compartment has a basic capacity of 550 liters (19.4 cu ft), which can be increased to 1,55sss0 liters (54.7 cu ft) by folding down the rear seat backrests. Standard equipment in Germany includes 20-inch cast aluminum wheels in a 5-twin-spoke star design, LED headlights and suspension with S-specific damper control. The eight-speed tiptronic transmission, quattro permanent all-wheel drive, sport seats in leather/Alcantara and a three-spoke, leather-covered multifunction steering wheel are also standard equipment. 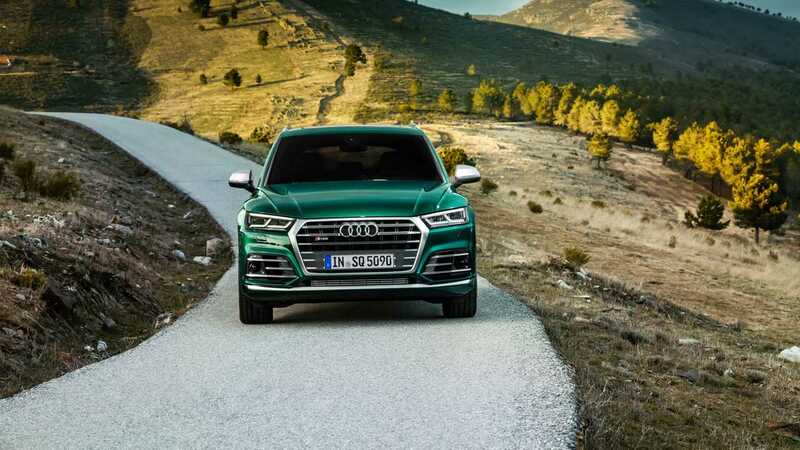 The new Audi SQ5 3.0 TDI will begin arriving at German dealerships in Summer 2019 and have a base price of 67,750 euros.